• A months-long investigation by Adairsville police into the death of a 4-month-old infant. An Adairsville woman has been arrested on a felony second-degree murder charge in connection to her alleged negligence leading to the death of an infant. Her arrest caps off a months-long investigation by Adairsville police into the death of James Raylan Wheat, an infant who was born in May 2018. Destiney Diane Wheat, 22, of 210 N. Main St., Adairsville, was taken into custody around noon Saturday. In addition to the felony murder charge, Wheat has been charged with felony cruelty to children in the second degree and misdemeanor possession of marijuana. Back on Sept. 28, 2018, Adairsville police along with fire rescue and EMS personnel responded to the Wheat home where the baby was found unresponsive. Police immediately detected a strong odor of marijuana inside the residence. The baby was found in a back bedroom and rushed to the Cartersville Medical Center where he died a short time later. Division of Family and Children Services personnel were notified because the house was in a highly unsanitary condition with dirty diapers strewn about, evidence of insect infestation and evidence of drug usage. Sgt. Eric Burns, a detective, led a months-long investigation that resulted in the Saturday arrest based on evidence that indicated negligence on Wheat's part. The infant had been wearing supplemental oxygen as part of an ongoing issue of sickness stemming from premature birth and other health-related illnesses. The investigation determined the child had not been administered the oxygen as prescribed by doctors, according to the oxygen machine diagnostics. It was also discovered that the mother had checked the infant out of the hospital a little over a week prior to his death, with the warning from hospital staff that doing so could result in the death of the infant. Wheat remained in Bartow County Jail without bond Monday. • Following a review of the improvements of 2018, Commission Chairwoman Becky Hood announces future developments the county will be working on. Delivering the "State of the County" address at Friday's Chamber Booster Breakfast was Commission Chairwoman Becky Hood, who reviewed past county projects and announced future developments. Becky Hood, in her State of the County address last week, talked about school safety, economic growth and emergency procedures that the county has put in place during 2018, as well as introducing future developments. In summary, the county updated safety plans, educated students on the dangers of substance abuse and opened the new Animal Control facility on Harris Beamer Road. In future goals, the county government plans to work toward updating the Health Department and Brookshire Park, as well as expanding the Senior Citizen Center. Hood reported that LOST — local option sales tax — and SPLOST — special purpose, local option sales tax — collections from the past six months have displayed an increase of 7 percent when compared to the same six-month period last year. Because of this growth, the county was able to roll back the millage rate from 9.8 mills to 9.6 mills. The county's overall financial net position also increased by almost $1.5 million from June 2017 to June 2018. Hood said this pattern has continued the steady increase in the county's net position that started in 2013. Industries in the county have also experienced growth, with additions such as Pilgrim's Pride and Mullinax Truss. Industrial expansions within the county have taken place at Mannington Mills, Mohawk and LG Electronics. Because of this growth, 400 business license renewals have been granted and over 50 businesses were opened in 2018. The county unemployment rate has dropped to 3 percent, which is the lowest the rate has been in the area since May 2000. The Gordon County Sheriff's Office and the Gordon County Board of Education recently implemented a plan to have deputies report to all county schools for safety and security measures. Also, Fire Chief Doug Ralston and his staff hosted a Public Safety Day at Home Depot, teaching children about fire safety and fire equipment. During 2018, the Sheriff's Auxiliary raised thousands of dollars for special needs in the community, and the Sheriff's Office hosted adult and youth leadership training programs. The Fire Department was also evaluated by the Insurance Service Office and improved their rating from 6/9 to 4/4y, which helps homeowners by lowering insurance rates. According to County Administrator Jim Ledbetter, in the 2012-2018 SPLOST, $2 million was spent on getting new fire hydrants in the county in order to reach a bigger proportion of residents in the case of fire. If a home is within a certain distance of a hydrant or a fire department, insurance rates are lowered and the associated fire department receives improved service ratings. The new Gordon County Animal Control Facility was also opened in late 2018. The SPLOST-funded project replaced the old facility which burned down in the spring of 2017. The new building, on Harris Beamer Road, now hosts animals and will start using their pole barn for larger animals when construction is complete. Hood announced the 2012-2018 SPLOST projects include the new Health Department, improvements to Brookshire Park, Senior Citizen Center expansion and phase one of the Courthouse project. The Health Department project is in the process of developing plans for a new facility, expanding the department by about 3,000 square feet (for a total of 11,300 square feet). The county acquired land from the state behind the current Health Department, on North River Street, where the new facility would be built. Architects have drafted a schematic design and plan to send out construction bids within the next few months. When complete, the old facility — which according to Ledbetter is not salvageable — will be taken down and turned into parking space for the new building. The Brookshire Park project is aimed at improving the park, located between Ga. 156 and the Oostanaula River, by adding a pavilion, restrooms, a walking trail, a wooden boardwalk along the river, a fenced area for dogs, picnic tables, a Frisbee golf course and a fish cleaning station. The revenue for the construction has been collected. Hood talked about the Senior Citizen Center expansion, which is a project still in the early stages of planning. The potential goals include putting an extension on the back of the building and expanding the kitchen and exercise areas. The next step is getting a schematic design and letting county commissioners look over the plan and approve it, according to Ledbetter. The second floor of the Gordon County Government Plaza, 215 N. Wall St., is being prepared for renovation in order for the courthouse project to proceed. The plaza, once completed, will host employees, storage and offices during construction of the courthouse. Ledbetter said the most economically efficient way for courthouse renovation to take place is through use of the plaza. The schematic design for the plaza's second floor is currently being formulated. Looking further into the future, the 2018-2024 SPLOST projects that have been approved include developing new greenway trails, Salacoa Beach renovations, a new athletic field on the east side of Gordon County and Sugar Valley Fire Station renovations. Hood recognized her fellow commissioners and local elected officials of the county before diving into an in-depth review of the events of 2018. She acknowledged the county departments for going above and beyond their regular responsibilities. Hood leads the Gordon County Board of Commissioners, having been first elected in 2007 and serving as chairwoman since a 2013 commission vote. Voting members of the commission include Kevin Cunningham, Bud Owens, Norris Sexton and Chad Steward. Hood served three years on both the Gordon County Chamber's Board of Directors and the Gordon County College and Career Academy Board, serving as chairwoman on the latter. She is a graduate of Leadership Calhoun/Gordon County and the Leadership Georgia Program. The cast of Gordon Central Performing Arts' production of "The Mystery of Edwin Drood" performs on Friday night, Feb. 22, 2019. Kaylan Gaines plays Helena Landless in "The Mystery of Edwin Drood," which gave the local audience at the Gordon Central Blue Box Theatre the opportunity to choose the ending of the musical. Characters Beatrice Lloyd, from left,, played by Sydney Rainwater; Helena Landless, played by Kaylan Gaines; and Rosa Bud, played by Katelyn Jones, come together on stage at on Friday night. • Mayor Jimmy Palmer announces GBI might be establishing a new regional headquarters and crime lab facility in Calhoun. Mayor Jimmy Palmer delivers the "State of the City" address during Friday's Chamber of the Commerce Booster Breakfast. In his State of the City address last week, Calhoun Mayor Jimmy Palmer presented the city's history of strong education, healthcare services and economic success, as well as announcing the potential of the GBI setting up regional headquarters and a crime lab in Calhoun. In review, during 2018 the city saw 500 new jobs enter the market, unemployment reach a record-breaking low of 3 percent and increase safety in city schools. Looking forward, the city plans to build a new police station on McDaniel Station Road and address the issue of dilapidated houses within city limits. area with the addition of new small businesses, events and family-friendly activities. He said the Downtown Development Authority has partnered with businesses and provided $40,000 in grants, supporting downtown developments and improvements. Unemployment in the city has lowered to 3 percent, which is lower than it's been for almost 20 years. 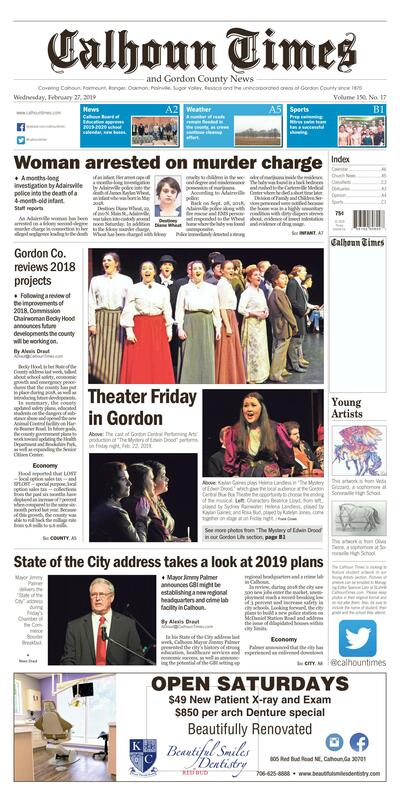 The city has also contributed funds to the Chamber of Commerce's convention to promote tourism, not just for the city but for the entirety of Gordon County, the mayor said. Palmer also reported that the city had some of the lowest water, sewer and electric rates in the state, and one of the state's lowest millage rates of 2.48 mills. He said for the average Georgian city the size of Calhoun, the millage rate hovers around 8.9 mills. One mill represents a tax liability of $1 for every $1,000 of assessed property value. Property is assessed at 40 percent of the fair market value. To further specify, Palmer said the average property tax for a $200,000 house in Rome would be around $800 and it would be $500 in Dalton, yet in Calhoun, it would be around $200. Palmer reported that Calhoun City Schools is continuing to improve, saying their leadership in the community expands beyond the areas of academics, the arts and athletics. With the CCS graduation rate in the area of 98 percent, Palmer said education has been vital to the thriving and growth of the community. The mayor also commented that the amount of quality health care services in the city is unlike that of other areas, and he's been able to see it improve year after year. And as far as public safety goes, Palmer announced that at the beginning of February, Calhoun was recognized as one of the top 30 safest cities to live in the state of Georgia by the National Council for Home Safety and Security. The city was also able to put another resource officer in the schools, as well as partner with the FBI and GBI in the Safe Streets Program. In 2018, Calhoun police officers were able to remove 124 drivers charged with DUIs off the streets. Past improvements to the Calhoun City Recreation Department have also allowed the department to participate in much more than athletics, and they have begun to host the STAR program, monthly events for children with special needs, summer camps and regular activities for seniors. Palmer also announced that during 2019, the city was likely to focus on bringing a GBI headquarters to Calhoun, working toward a new facility for the Calhoun Police Department and moving forward with taking down dilapidated houses. Palmer mentioned a project that the late state Rep. John Meadows was working on, which consisted of the possibility of having a GBI headquarters and crime lab in Calhoun. Palmer, who's reached out to District 11 Rep. Rick Jasperse, said the Georgia General Assembly is working with the city on this project, as well as with Gordon County Sheriff Mitch Ralston and Calhoun Police Chief Tony Pyle. According to Palmer, both the House and the Senate approved to allocate $75,000 toward this development. Palmer also reported that he had personally written to Gov. Brian Kemp to ask him for support for this project. In addition, the city is looking to begin construction on a new CPD station this fall, and city officials will have to determine over the next few months how to get the additional $1.8 million needed for the project. City Administrator Eddie Peterson said there is already $1.8 million in SPLOST funds for the new station on McDaniel Station Road. But the total cost for the 14,000-square-foot building is $3.6 million, he added. And with the building expected to take 12 months, it will cost approximately $300,000 each month. The design and engineering work for the station, which is set to be built on a 10-acre plot deeded to the city by the Development Authority, was finished in May 2018, Peterson said. A new station would allow the city to move the detective division out of a building at Tom B. David Airport, and create the needed additional space for the department. The mayor also addressed the issue of dilapidated houses within city limits, saying the city was getting aggressive with those kinds of houses in the community. He said the city has already taken down several, and has scheduled six to come down in the next few weeks. In summary, Palmer was very complimentary of the quality of life for Calhoun residents and the economic success of new businesses, commenting that two of the city's main strengths are education and health services. Palmer has been mayor of Calhoun since 1998, having served as a city councilman for five years preceding his mayoral election. Previously, he had served five years as a member of the Calhoun Board of Education. He was a pharmacist at his family pharmacy, Palmer Drug Company, for 34 years, and is now associated with Calhoun Drug Company. He leads the City Council, which consists of George Crowley, Ray Denmon, Al Edwards and Jackie Palazzollo. This artwork is from Veda Grizzard, a sophomore at Sonoraville High School. This artwork is from Olivia Tierce, a sophomore at Sonoraville High School.